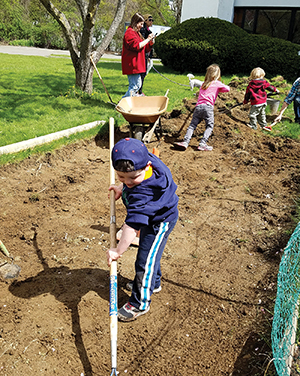 Children learn about farming and help plant a vegetable garden at Temple B’nai Abraham in Beverly. “YES!” the children squawk in reply. Surprisingly, the joke works. A few minutes later, after B’nai Abraham Rabbi Alison Adler gives a short, kid-friendly lesson in Judaic horticulture and leads them in a blessing, the kids eagerly grab handfuls of seeds, dash into the garden, drop to their knees, and begin planting. “And when ye reap the harvest of your land, thou shalt not wholly reap the corner of thy field, neither shalt thou gather the gleaning of thy harvest. In keeping with this decree, most of the vegetables harvested from B’nai Abraham Pe’ah Garden are donated to Beverly Bootstraps, a nonprofit that provides food assistance to local families in need. A small patch of the garden is used to grow horseradish for Passover and a slightly larger patch for flowers that are picked by toddlers who present them to their parents and visitors during Tot Shabbat evenings cosponsored by the Lappin Foundation. Herbs also are dried and packaged by the kids for use as besamim (spices) for the Havdalah ritual that signals Shabbat’s end. In the fall, corn stalks and sunflowers from the garden are used to decorate the community’s sukkah. It’s also just plain fun. This year, after the sugar snap peas were all planted, one mom, Tammy Weiss, informed her 7-year old daughter, Annabelle, that religious school would soon be over for the year. Annabelle was almost in tears. Not to worry, Annabelle. At 10 a.m. on Sunday, June 3, all kids can experience the Pe’ah Garden when the PJ Library hosts its Garden Party and Circus. The event will star Vegetable Circus, an act featuring juggler Brian “Hot Soup” Walden and circus hooper/stilt walker Laura “Little Legume” Hanley. The pair uses its amazing talents to educate youngsters about ecology and nutrition. Snacks also will be provided, and those who wish may assist in planting seedlings that religious school students started from seed during the winter holiday of Tu B’shevat. In addition, the entire North Shore community is always invited to come to Temple B’nai Abraham on Sunday mornings throughout spring and summer and help work in the garden. Jim Younger, architect, jokester, and weekend farmer will be presiding.